I use 1 medium and 1 small beet and it works out about perfect every time. Wash beets to remove dirt. Place on baking sheet and roast in 400 degree F oven for about 1-1 1/2 hours. Beets should be very soft when a knife is inserted into the center of the beet. When beets are cool, remove skins and throw into a food processor. Process until beet is very smooth. Note: beet juice stains! Be very careful when handling the peeled beets. Measure 3/4 cup beet puree, reserving rest for another use. Place beet puree back in food processor. Add remaining ingredients, in order, processing between each ingredient. Batter will be a little thick, but still slightly runny. Line muffin tin with cupcake liners. Scoop ~3 tablespoons batter into each cupcake liner. Bake at 350 degrees F for about 18 minutes. Cupcakes should look done in the center when you remove them from the oven. Remove cupcakes from pan and let cool completely on a wire rack. 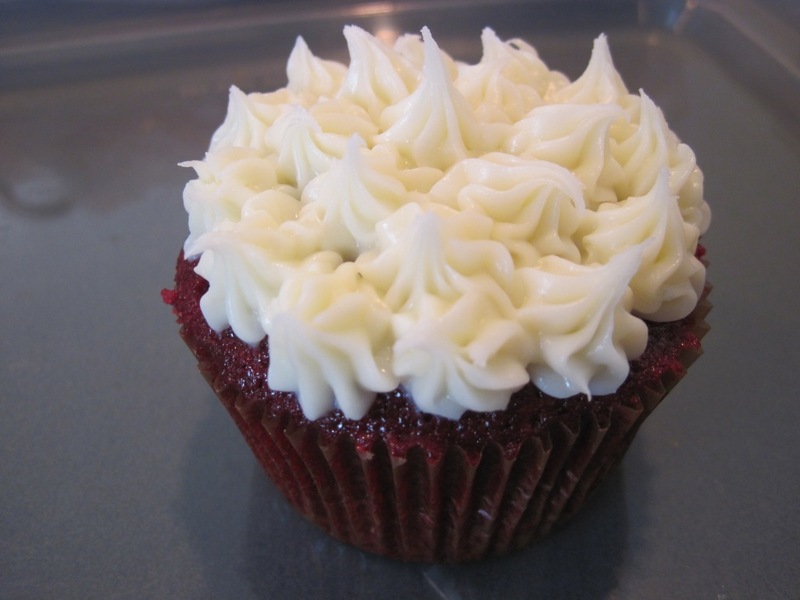 Frost with white chocolate cream cheese frosting (below). Isn’t that a beautiful cupcake?? By the way, this recipe also works well with roasted carrots, producing a nice dark orange cupcake. I’m going to try this recipe with golden beets this summer to see how that works. I’m hoping for stupendous gold cupcakes! 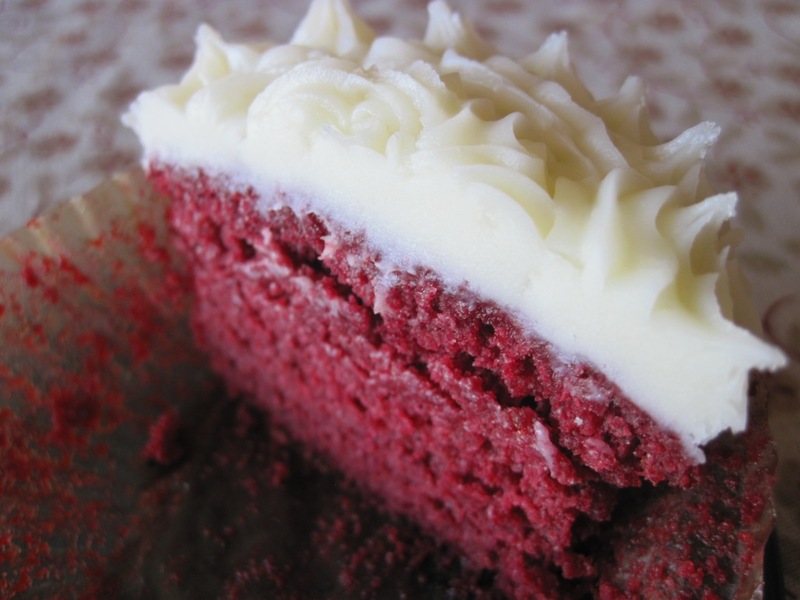 This entry was posted in Food and tagged beets, food, natural red velvet cupcakes. Bookmark the permalink. I just found your blog and am honored to have inspired a blog post. So I haven’t been able to get this recipe to work since moving to CA, I’m not sure if its the lower elevation or my stupid oven, but I was wondering if you have any suggestions on how to I might adjust the recipe for the lower elevation? Hey Cupcake! I was thinking about what you described…you might try reducing the amount of liquid you use in the recipe (like the buttermilk, maybe) by about 1/8 cup and see if that makes things better or worse if they aren’t cooking all the way through. The other thought I had is…and this would require more steps and dirty dishes…is to separate the eggs and beat the egg whites until they form stiff peaks. Make the batter like normal with all the other ingredients (including the egg yolks) then at the very end fold in the egg whites. That might help provide some extra lift during baking. Or, if they aren’t looking too done on top, try baking them a little longer. There’s so many variables (including your oven) that could be affecting the outcome, so maybe try one next time to see if you can find one that helps. Good luck and let me know if you get them to work!